The fire alarm for the fire safety system in the 1958 Orlando City Hall in Downtown Orlando, Florida. The building was located on the corner of South Street and Orange Avenue and acted as the place of governance for the growing Orlando area. The fire alarm allowed the building to fit into the newly formulated fire safety regulations, acting as one of the fire protection features. This was following the scramble for fire safety in 1956 when more than 713 calls were made concerning fires and costs overwhelming damaging the city’s wallet at an estimated overall cost of more than $300,000. City Council’s involvement with the firefighters in the city saw huge improvement in 1954 when the council approved a salary raise for the workers. Original fire alarm: Orlando Remembered Exhibit, Orlando City Hall, Orlando, Florida. "Winter Park Fire Department: Bravely serving the community since 1900." Winter Park Public Library. http://archive.wppl.org/wphistory/Winter%20Park%20Fire%20Department.html. "Past Presidents." Florida Fire Chiefs' Association. http://www.ffca.org/i4a/pages/index.cfm?pageid=3312. 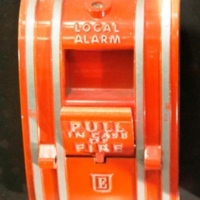 “Fire Alarm at Orlando City Hall.” RICHES of Central Florida accessed April 26, 2019, https://richesmi.cah.ucf.edu/omeka/items/show/7889.